Everyone faces storms in this life, but God promises hope and victory. In Pastor Jeff Schreve’s series Turning Trials to Triumphs, he journeys verse by verse through 2nd Corinthians to reveal how our great God can turn your worst trial into His greatest triumph just as He did for the apostle Paul. 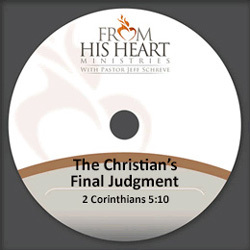 It today’s message, THE CHRISTIAN’S FINAL JUDGMENT, we’ll learn valuable and practical truth from 2nd Corinthians 5:10.